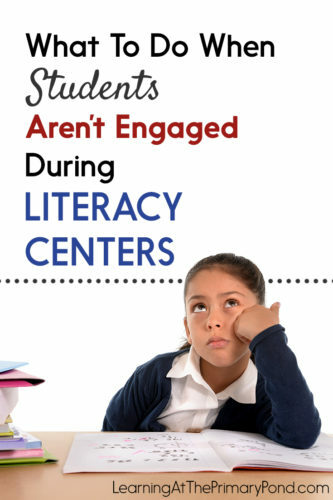 Do you struggle with keeping students engaged during literacy centers? Are your kids off-task, even though you spend TONS of time finding fun activities for them? Keeping students engaged during centers can be SO challenging. Part of the issue is just that…well, they’re kids. They’re still learning to be independent, and that takes time! BUT there absolutely ARE things we can do to improve student engagement. After a lot of trial and error, I’ve found some strategies that really work! In this post, I’ll share the questions I ask myself + the “fixes” I try when my students aren’t engaged with their centers work. I’ll also share tips for getting your kids back on track! First, I observe my students closely so that I can pinpoint what the problem REALLY is. I cancel one small group and allow ALL my kids to work in centers for about 10-15 minutes. While they work, I stand back and observe quietly. I look to see if a small number of students are off-task, OR if nearly all my kids are having trouble. Do the kids understand the activity? Is the activity too difficult or too easy for them? Are the groups I’ve made not working well? After you’ve made your observations, it’s time to get your kids back on track! In whole group and/or small group, teach any expectations that your students need to work on. Make changes to your groups, if necessary. Make changes to your OWN plans for introducing activities, if necessary. Teach self-reflection. I want my students to know that their behavior during centers MATTERS! 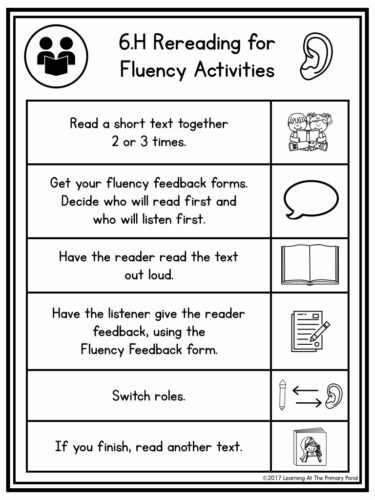 Once a week, have your students fill out a quick self-reflection form like the sheet below (from my K-2 literacy center bundles). 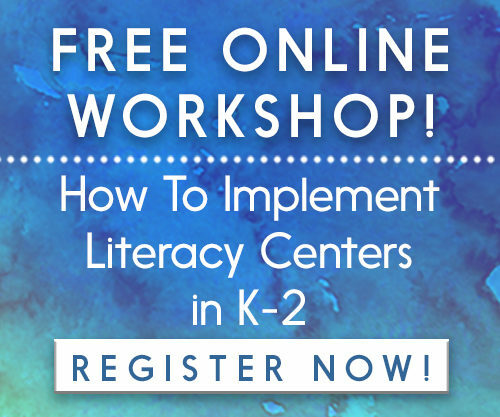 Make sure kids really know what to do in each center. Kid-friendly directions have made a big difference for my kids! Even if they can’t read the text, they see the pictures and are reminded about the directions for each activity! As I mentioned before, it might *SEEM* like your kids are disengaged, when in reality, they’ve just forgotten how to do the activities. Try making your own kid-friendly directions or using the ones in my K-2 literacy centers bundles. Create a balance of consistency + variety. My students often forgot how to play the games I taught them. As a result – you guessed it – they got off-task! 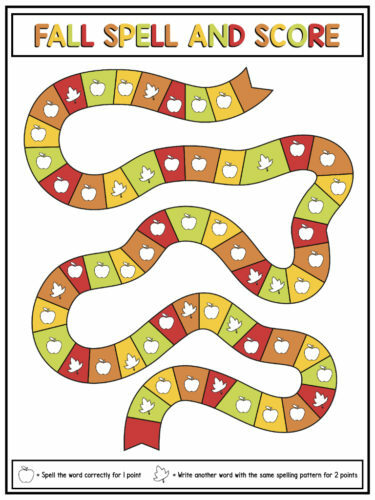 To solve this problem, I decided to a) teach my kids a small set of games and activities and b) just rotate out different themes for those SAME games. 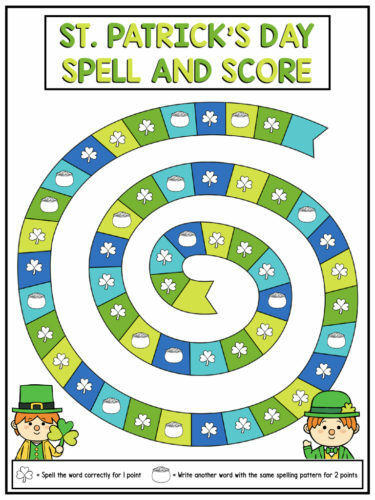 That way, if they know how to play Spell and Score, for example, they can enjoy it with a fall theme and later on in the year with a St. Patrick’s Day theme. Try a whole-class incentive. When I feel like engagement has become a big problem, I cancel centers for a day. I re-teach procedures and expectations. Then, going forward, I offer a whole class reward for x number of “good behavior” days during centers. Or I add marbles to a jar every time the class does a good job during centers (and then the class gets a reward when the jar is full). If you go this route, be sure to emphasize the importance of teamwork. If the class has a rough day, do not tolerate students blaming or calling out individual students. Try an individual incentive. Some days, I announce that I will be choosing a “Model Student” during centers. I announce the winner at the end of centers time and discuss what that student did exceptionally well. The “Model Student” might get a small reward or the opportunity to be a centers leader the following day. Consider tightening up your consequences. I’m all about positive reinforcement, trust me. But I also have super high expectations for behavior, especially during centers. 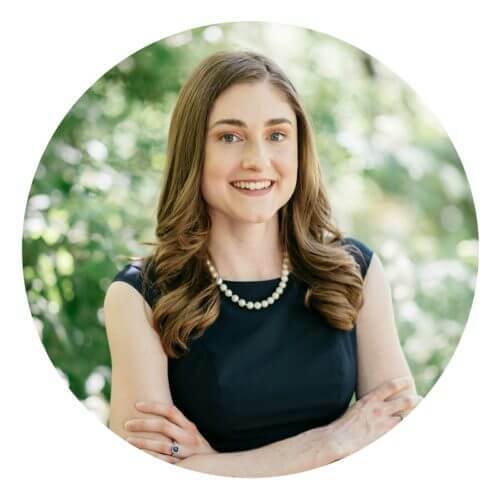 If I’m concerned that kids will exhibit or have been exhibiting a certain behavior (i.e. throwing playdough instead of making words with it), I explain that if they do this during centers, they will immediately be removed from the center. They will have to work somewhere else (and potentially alone). And then —if I do observe a child exhibiting that behavior—I give no warnings. I immediately place them in another center. Once your kids know that there are clear and immediate consequences, they really will do a better job with following directions. If you’re struggling with student engagement during centers, try one of these strategies. And let me know how it goes—I’d love to hear from you! If you’re looking for the resources pictured in this blog post, check out my Kindergarten, first grade, or second grade literacy center bundles. 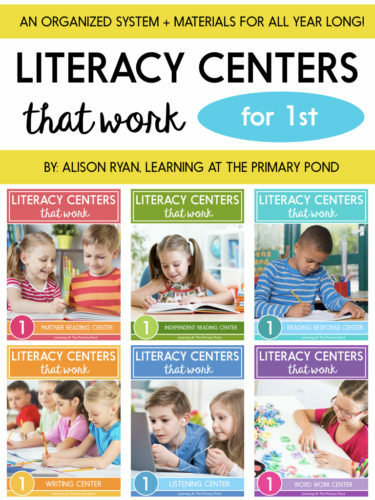 Get your students excited about centers again with meaningful, engaging activities! I truly realize that a lot of time I want to start my small groups early…probably too early… I know that often, I run into problems like kiďs that don’t know how to behave or are not engaged. I really liked the part where you reward them for their good behaviors during centers. I’m sure that would be beneficial. Immediate feedback is the key! So true! It definitely takes time for them to be successful independently! Your ideas are so encouraging to me! (I am a fan) I teach a K2 Autism Support class. So much of my teaching has to be one on one so I need “center ideas” for the students that I am not working with. It is encouraging to know that typical students need time to learn how to work independently. Regular education teachers spend a lot of time teaching and prepping their students to do work independently. I’m so glad, Ann!! 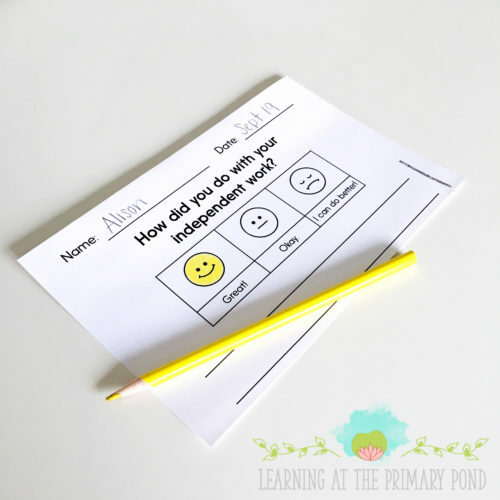 Yep, I feel like teaching that independence is half of the job sometimes. Thanks for reading and sharing this!! I love reading your blogs. You have great suggestions on centers. It’s so helpful to read your blog! I’m teaching Grade 2 for the first time this year, and after almost 3 terms (I’m in Melbourne, Australia), I feel like I’ve almost got on top of it all. Starting groups too early? Absolutely my problem! I’ve been too eager this year and it has taken me a while to work out that my kiddies need more time to learn the ropes before I let them loose. I only hope I get Grade 2 again next year so I can try out your ideas again! Hi Michaela! It’s so tempting to start groups early – I totally relate to that! Fingers crossed for you to get Grade 2 again next year! Thanks for this blog, very helpful. Thank you for this post! I have a very difficult class this year. This post is so full of practical advice to help me steer things in a better direction. Such well organized, succinct, practical reminders. I appreciate it! I’m Alison, a literacy specialist and consultant. I love getting kids excited about reading and writing – and sharing literacy ideas with other teachers!